Hello Guys, today I am going to tell you about how to scan document using Xiaomi Redmi devices like Redmi 2, Redmi Note 3, Redmi 3s or any other Android, this app works same on all android phones. 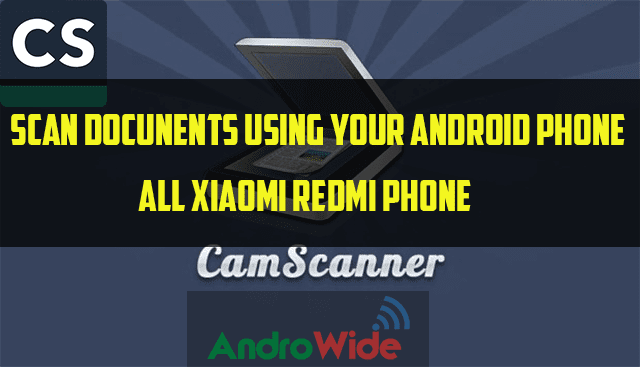 as Android has many great productive apps on their Play store to make our life easier this will also help you to scan any kind of your document using your Redmi phone, it just requires a bit good quality of camera which is on your device, so let’s get started with the steps you have to take to scan document on Redmi phone. Also you choose the color of you doc like auto, lighten and more. Just see on the top you can these options as well. And it’s done, you have successfully scanned a document without any scanner by just using your Redmi Phone. now you can share this scan with anyone in PDF or JPEG format, also it provides Cloud Saving of you scanned document, so you can store all you scanned docs on their cloud so that you can forget all the fear of losing any of your scanned documents, just make an account on CamScanner app and you can manage all your document by signing in to your CamScanner Account, on laptop PC or you phone.